On Equal Pay Day, April 2, which symbolizes how far into the year women must work to earn what men earned in the previous year, NewsGuild-CWA members stood up for equal pay by posting on social media, putting up table tents, and talking with their colleagues about how unions can address pay discrimination directly. The NewsGuild-CWA also launched a website, newsguildequalpay.org, to help journalists join together to address pay discrimination and improve working conditions by continuing the wave of union organizing that has been sweeping through newsrooms across the country. 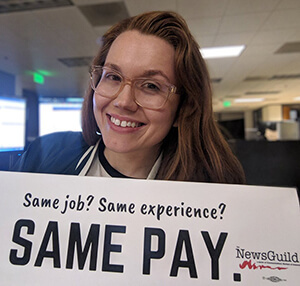 "Reporters, editors, photographers, and other news industry employees have learned that one of the best ways to fight for equal pay is to join a union," the NewsGuild said in a statement. "Collective bargaining gives workers a way to stand together, share information, and address inequality in their workplace."